A little-known fact about the Tom Swift Jr. Series is that the first edition of the book Tom Swift and his Aquatomic Tracker (#23 in the series) have a fold-out ad at the end of the book. Copies of the edition with the fold-out ad are very hard to come by. However, recently I was able to find a copy, and I decided to post some information and scans. 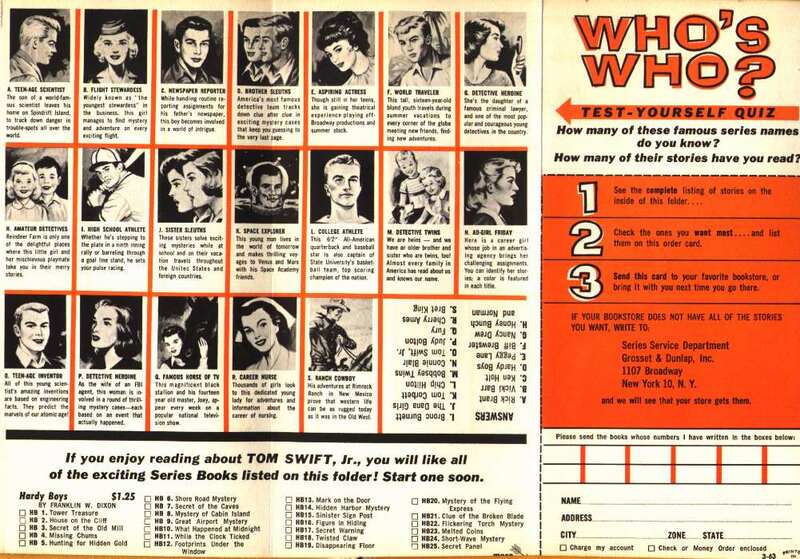 The other side of the ad (to see a scan of it, click here) has a listing of various series books. 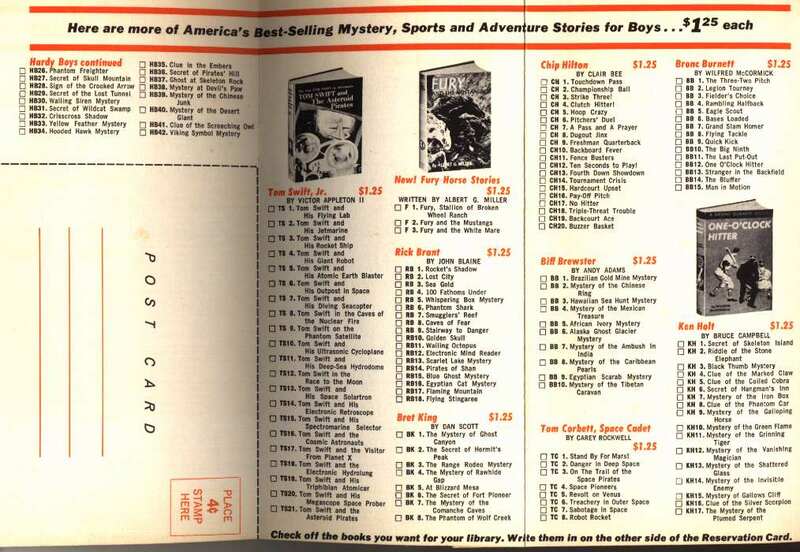 It lists Tom Swift Jr. up to #21, Rick Brant up to #18, Ken Holt up to #17, Chip Hilton up to #20, the Hardy Boys up to #42, and many others. Each title listing has an ID and a check box next to it. The idea seems to be this: you check the boxes next to the books you want, and then you send the card to the bookstore. If the bookstore doesn't have them, you can write a letter to Grosset and Dunlap who will then "see that your store gets them." I don't know why so few books were printed with the ad, or why no other Tom Swift books ever came with one. Perhaps there was little response to the ad, or maybe the ad was too difficult and expensive to print for the limited response it received. As far as I can tell, the ad is only located in first-edition copies of the title; as the back of the book only lists to #22 (Tom Swift and his Repelatron Skyway), it seems logical to conclude that the ad was issued with the first printing, and was then discontinued.